Nowadays 802.11n wireless technology has been widely deployed and integrated into some networked devices as a preferred wireless module over existing 802.11a/b/g especially for bandwidth-hungry applications. In view of higher demand, Mvix USA has just unveiled a new miniature wireless 802.11n compliant module suitable for mobile market. 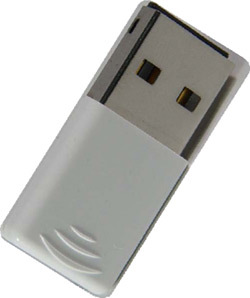 Named as Mvix Nubbin MS-811n, it is claimed to be the world’s smallest USB2.0 802.11n adapter that can offer significant higher data transmission rate as compared to current solution. The MS-811n is a tiny adapter and with its less than 2cm protrusion dimension from laptop edge, it is powerful enough to be able to deliver up to 150Mbps data transfer rate, which is about three times from conventional wireless technologies. Good thing is, it is backward compatible to 802.11 b/g with further advanced features support such as WPS (Wireless Protected setup) and MIMO (Multiple Input Multiple Output) with proper security encryption like WEP 64/128, WPA and WPA2 for more secure environment in digital home. The tiny module is currently available at $39 which is quite affordable to make the web surfing a much more pleasurable experience.